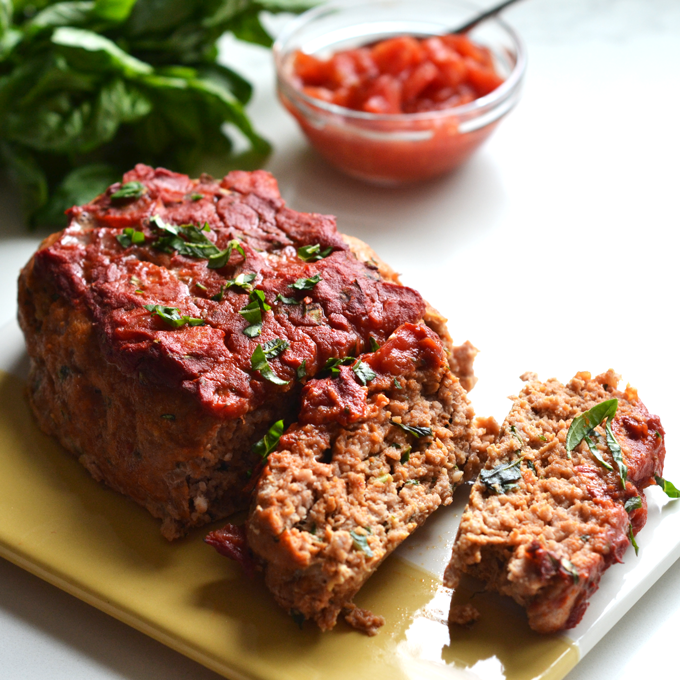 Let’s talk about this Tomato Basil Turkey Meatloaf people. The other night Matt and I were making a meatloaf, which we do all the time, when I realized I have never put a recipe on my site for one!! I seriously didn’t believe it and searched my blog for one and NOTHING! I apologize! I think my hesitation has been that they aren’t the prettiest things to photograph and are SO easy to make – but that is the best right? Who wants pretty meatloaf anyways. When we make meatloaf it always turns into an Italian meatloaf because we just gravitate towards the oregano and basil once the tomato paste goes in! So I thought I would actually measure things this time and put together a solid recipe – which this definitely is! I love meatloaf for many reasons but the main one is that it could not be easier to make. We make meatballs a lot too and this is basically the same thing without all of that effort to form them into balls. Just plop the whole thing on a baking sheet and free form it into a loaf like shape – pour some stuff on top and bake! Fresh basil!!! I am a huge fan of dried herbs don’t get me wrong, but there is something about basil in particular that is SO much better than dried. I can’t explain it, just trust me! I want to work on getting an herb garden when I have some time to start working on our backyard and I will, at that point, need SO much help. I have a black thumb and I really want to figure out how to just keep a few herbs alive! My from Lindsay who runs the blog The Toasted Pinenut, and I were talking about this the other day and agreed Rosemary and Mint would be good ones for me to start with! I’ll report back on that later! So delish and easy to wolf down – you have been warned! 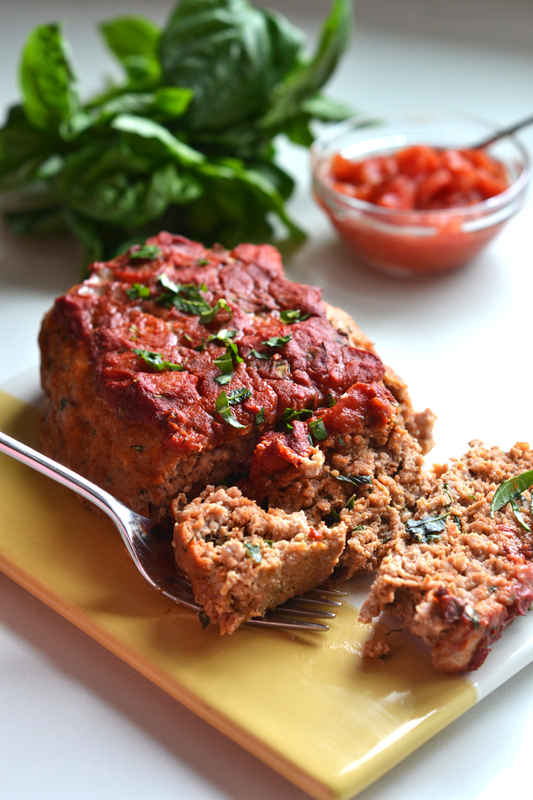 Pin this Tomato Basil Turkey Meatloaf recipe to save it for later! Preheat oven to 400 degrees. In a bowl combine turkey, almond flour, 2 tablespoons tomato paste, 3 tablespoons chopped basil, egg, garlic powder and 1 teaspoon salt. Mix until evenly combined. Ball up all of the meat mixture and place on a foil lined baking sheet, then form it into a loaf shape, about 8 inches x 4 inches in shape. In a small bowl combine 2 tablespoons tomato paste, chopped tomatoes, apple cider vinegar, 1 tablespoon chopped basil and pinch of salt. Spoon this mixture over the meatloaf and spread evenly over the top. Bake for 30 minutes. Could you do coconut flour instead of almond flour? Yes! Just use a little less than a 1/4 cup! I only have arrowroot flour, can that be used? I haven’t tried that in place of almond flour! Have you tried subbing ground chicken instead of turkey? No but I am sure that would be great as well!! I subbed ground chicken and it takes the same I think! Can you use brown rice flour instead of almond flour? Can I use regular all purpose flour instead? This was delicious and super easy to make. Even if not doing a Whole 30/Paleo/hippie-dippie diet, I’d still recommend this! Thanks for sharing your recipe. can you add onions to the meat loaf mix? Sure! I bet that would be tasty!! Hi, can I use oat flour instead? 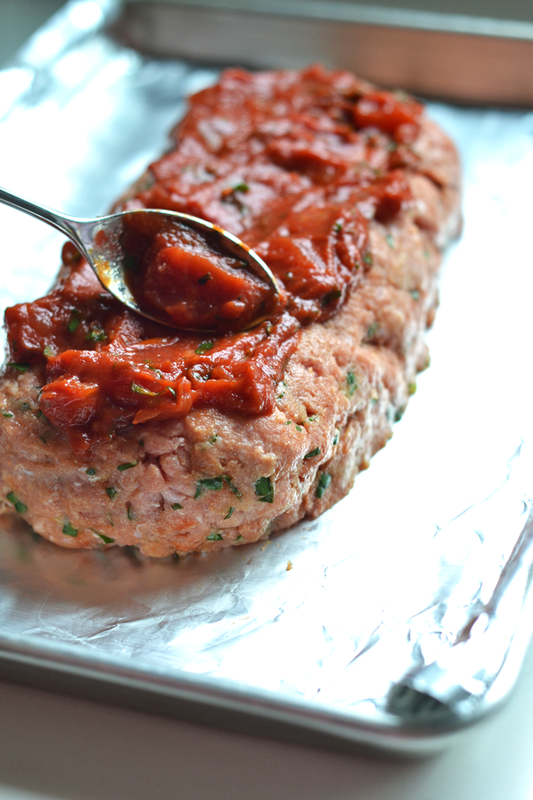 Do you have the macros for this meatloaf? I don’t! You can enter the link in my fitness pal though! I tried putting it in my fitness pal but it doesnt have this exact recipe so what do I choose? You should be able to copy and paste the link in, or you can just enter in the amounts! I had to modify a bit – tomato sauce instead of paste, and oregano instead of basil, but this is what I calculated. I got 6 servings out of the loaf and made it per the recipe, it was 3% carbs, 21% fat, 20% protein. Hello, How many servings does this make? I have a large family to cook for. This is about 4 servings! Can you make these into muffin tins? And if so would you still bake the same temp and time? That would be great! They would probably cook up in about 20 minutes though! So my 32 year old husband has the taste buds of a 12 year old boy. I made this recipe because we’re doing the Whole30 and I bought a 3 lb tray of ground turkey. I fully expected groans when I declared we’re having meatloaf. To my surprise, both the husband and the 8 year old asked for seconds! Hubs even asked to put this into the rotation! So it’s terrific! I will have to say after 23 days on W30, it’s a tad salty for my taste buds, but an easy correction for the future. It also made a great W30 breakfast today! Aw Carrie that is AWESOME!!! So glad they all liked it! And yes salting is definitely based on preference! Thanks so much!! You can use it, it is just a bit more gritty! Love this recipe! Not only is this healthy and clean, but it is super yummy. I made it for my family (myself, hubby, son (13) and daughters (9) and they all loved it and wanted seconds. I am making it again tonight and will be making two loaves!! Thanks Kelsey! That is sooo great!! So glad to make recipes for the whole fam!! Thanks so much!! Just love this quick delish recipe! Thanks! If you use ground beef instead of turkey, is the cook time the same? Hmm It should be close, maybe add 5 minutes! This is amazing! I do love finding new recipes for my fresh basil plant. Do you think you could put mozzerela in the middle to make caprese like? If you eat dairy that would be a great idea! I made this recipe and loved it! The only change I made was to use almost a whole cup of chopped tomatoes in the topping. It came out amazing. It has a cheesy flavor and texture, which was a real treat since I’m not eating dairy. Thanks for the great recipe! I will definitely make it again soon. That is great!! Love the extra tomatoes, they are the best! Glad you enjoyed! This was SO good! Turkey can be so boring and dry- but not in this meatloaf. I used almond meal because that’s all I had, and it still turned out great. This was the first recipe I’ve made from your blog and definitely won’t be the last! Ah thanks Marisa!! So glad you liked it, one of our favorites! So if you make this recipe how many does it feed? If we choose to double the ground turkey do we need to double everything else too? Yes, I would double everything if you double the turkey! The regular recipe has about 4 servings! If you double the recipe do you need to add cooking time? Yes! Unless you just make 2 separate loaves then it should be the same but maybe add 5 minutes! This sounds almost like my recipe, except I use 1 min oats instead of the almond flour, never thought of putting flour in meatloaf! I also add a dash of garlic powder. Love the basil flavor! It is an easy herb to grow, mine even came back this spring since we had a milder winter in Oklahoma than usual! A huge favorite in our house! So easy and so yummy! Amazing!! So glad you love it!! Absolutely amazing recipe! I substituted the ALmond Flour with blended rolled oats (cheaper version) and it was absolutely tasty! My boyfriend loved it as well as my coworkers. Must truly! This was a great recipe – will definitely make again! I added half of a large green bell pepper as well as an herb mix I bought once while traveling that includes sun dried tomato, red pepper flakes and oregano. I also subbed garlic powder for fresh minced garlic. That all sounds so fab! So glad you loved it! Omg! 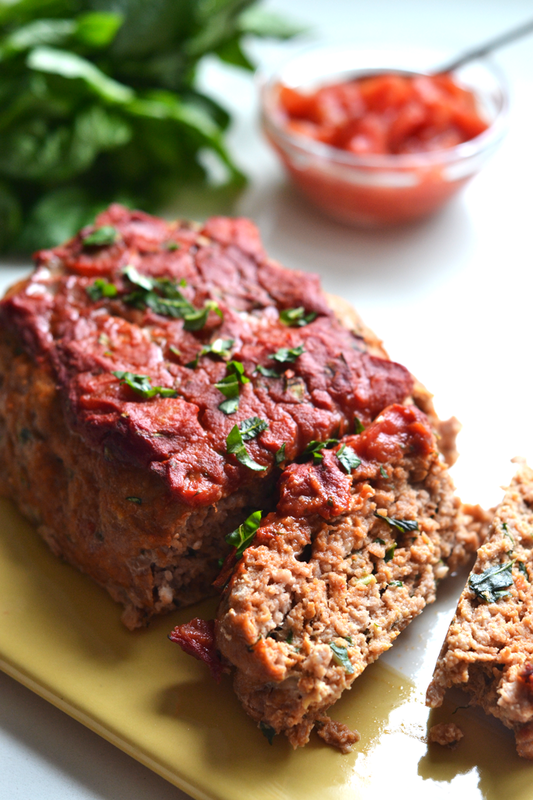 I was known to make the best meatloaf around mybkids and their friends…. but this jut made It become so much better!!! Can you put this in a bread pan? If so will that change the time? You can! I haven’t tried it like that so I am not sure of the baking time but i bet it is similar! I tried it in a loaf pan last night and had to almost double the time. Maybe it was my pan. I made this last night to bring to work for lunch and WOW!!! The sauce on top is soooo good and You’re so right about the fresh basil!! I sautéed some onions, garlic, mushrooms, tomatoes and tomato paste to eat with it. This was the first time I have ever made meatloaf and I am obsessed. Can’t wait to try the breakfast one. Awesome!! So so glad you loved it! So yummy! While making the topping I kept thinking, “I really just want my ketchup and brown sugar mix.” But, after tasting this, there is no going back. I did add a shredded zucchini (on purpose) and forgot the egg (by accident) and it still turned out perfect. Thanks for posting this- I am allergic to eggs and was searching through the comments to see if it could be done without. Kelsey, you are so right about the fresh basil. It’s the star of this meatloaf. So dang good! For the topping is the apple cider vinegar a necessary ingredient? This recipe looks super yummy!! I think it adds a nice flavor but you can use water or lemon juice if you are opposed! Sounds amazing!! I would try regular time to start off! This is a staple at my house! So flavorful and easy! You can also make it your own as well. Don’t worry if you don’t have almond flour…I didn’t use any flour (always out of stock in my stores) and it stayed together just fine! I also add onions and on occasion a jalapeno! Easy to make, delicious, and healthy! Need I say more?! Yummy. I had a pound of ground turkey defrosting and no plans for it. I Googled “Whole30 Turkey Meatloaf” and was delighted to find your recipe. I used almond meal instead of flour, dried basil instead of fresh (1/2 the amount recommended), and I had a can of crushed tomatoes that I used in place of the real tomato. It looks fantastic! Can’t wait to chow down. Made this last night for dinner. Almond meal instead of almond flour, crushed tomatoes from a can in place of the whole tomato, and dried basil subbed for the fresh (used half of the amount called for). INSANELY delicious, and my 4.5 year old son gobbled it up! Thanks for this great recipe that I Googled after realizing I had a pound of turkey defrosting and nothing to do with it! Ive made dozens upon dozens upon dozens of whole 30 recipes from the web and this is by far the best and easiest one yet. I almost so excited to have found it!!! Thank you! This is absolutely my all time favorite recipe for Meatloaf!!! It is so good!! I had to add it to my monthly meal must haves! It’s so easy to put together and so yummy!!! I usually have cherry tomatoes on hand that are too ripe to use for salads (because who really wants to eat a salad every day??) that I just throw in the food processor to use for the topping (with the other topping ingredients of course). I can’t rave about this recipe enough!! I wish I would have found it years ago!! Love that cherry tomato idea!! Delicious and super easy! Freezes really well too. This meatloaf was super delicious! My 4 year old and 15 year old both approved so I will take that as a win and put in the books as a repeat recipe! Any idea how to cook this in a crock pot? We try to avoid using our oven because the gas is expensive where we live, so when we do meatloaf (beef) it’s usually done in our crockpot. Do you think it’d be a similar cook time to a beef meatloaf in a slow cooker, or would it be different? How long do you think I should wait to add the topping when cooking this way? I feel like it’d get cooked out if added at the beginning of the cook time in a crock. So sorry I have never cooked something like this in a slow cooker! This recipe is amazing. I actually doubled the amount of tomato/tomato paste topping. One of my favorites. I tried this recipe and loved it!! I normally stick to a regular beef meatloaf, but wanted to mix it up since beef sometimes hurts my stomach. I don’t think i’ll ever go back to beef meatloaf! A little switch I made was switching out the almond flour for gluten-free breadcrumbs… I already had these in my kitchen and didn’t want to spend mega $$ on almond flour. Ended up working very well! I only used a 1/4 cup for the breadcrumbs to take down the total grams of carbs in the recipe since I track my macros. This will definitely be a go-to recipe of mine! Thank you so much for sharing! This is outstanding. Even my 3 yr old son loves it and he is picky. Outstanding. Entire family loves it. Very good! Easy. Whole family ate it! I made this tonight and it is sooo good!! I shared it with my friends because everyone needs this recipe in their life! 2nd time making this. I double the recipe cause my son is a big meat eater and I want leftovers. It is easy and delish! I love it. Great recipe. I plan to make this recipe later in the week, from the feedback, it sounds amazing! What about using in a loaf pan? Do you just cook on some foil/in a pan? I haven’t don’t it in a loaf pan before! I just form it on foil on a pan! Can you freeze this turkey meatloaf? If you are going to freeze I suggest slicing it first then freezing in separate slices maybe with parchment paper between the slices for easier defrosting! This is a delicious recipe! It has become a regular menu item in our house because it’s easy, healthy, and tasty. We’ve even been known to have a slice for breakfast. I am so so glad! Wow, this is so tasty! And so easy to make. I just started a 30-day reset and am excited to explore more of your recipes. I’m sure I’ll be making this again and again, even after my 30-day reset.